The Central Adirondack Association (CAA) has a number of events planned for June, with the big kick-off on June 1 and 2 with the annual Thunder in Old Forge motorcycle event. Following closely on Tuesday, June 5 will be the organization’s Spring Fling social gathering and annual awards presentation at Thendara Golf Club. During the Spring Fling, the CAA will be honoring four individuals with honorary memberships, volunteer of the year, and a lifetime achievement award. This year’s recipients of the lifetime achievement award are the late Frank Burnap and his wife, Beverly, former owners of the Farm Restaurant. This entry was posted in admin and tagged Dana Armington on May 31, 2012 by Dana Armington. The Central Adirondack Association (CAA) recently launched its updated website, VisitMyAdirondacks.com, which now includes categorized event listing pages, a member directory and log-in area, as well as an area vacation guide. Old Forge, Inlet, Long Lake, Raquette Lake, Indian Lake, and Forestport all have their own pages on the website where visitors can go to view a map and history of each area as well as web links to the information centers in each area. According to CAA Events Coordinator Laurie Barkauskas, the new website is more event-driven and is a great way for visitors to find out what is going on across the Central Adirondack region. Included on the website is a vacation guide that can be either printed or viewed as an electronic document. Within the document, readers will be introduced to each individual area with an accompanying activities section. Also included in the guide is a map of area hiking trails. In addition, the site has sections for attractions, and a complete business and emergency services directory. This entry was posted in admin on May 31, 2012 by admin. Piano students of Valerie Gaudin will present their annual Spring Piano Recital on Tuesday, June 12 at 7 p.m. at Niccolls Memorial Church. Enjoy music performed by: Fern Bailey, Chloe Barkauskas, Allyson Brosemer, Chloe Brosemer, Julie Brosemer, Megan DeFilipps, Clifford Donovan, Alexis Hollister, Mallory Kleps, Alexcia LaFountain, Morgan Payne, and Jack Rivet. Refreshments will be served immediately following the performance. The recital is open to the public. Verona Labs will provide pick up of water samples for testing on Tuesday, June 12. Support for the Town of Webb Historical Association and the Goodsell Museum comes from many sources. The Polar Bear Ski Club will hold its annual Tent Sale on Saturday, June 9 from 8 a.m. to 3 p.m. at the lot across the street from Randy’s Restaurant. Donations are welcomed and can be dropped off at the site on Friday, June 8th at any time. No donations will be accepted on Saturday. More information is available by calling Janine Phaneuf at (315) 369-5240. 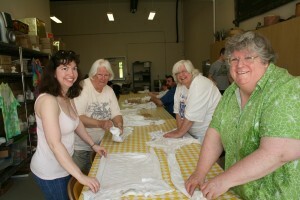 From right are Denio sisters, Debbie, Martha, and Maryellen, with cousin Londa Stenzel. The Denio family holds a family reunion in Old Forge every year, usually over Memorial Day weekend. 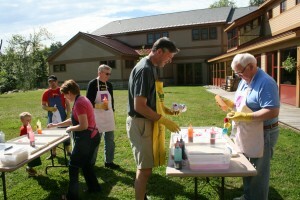 Each year they plan a variety of activities for the event and this year they all took part in a special tiedye activity at View. View instructor Barbara Getty led the activity, offering step-by-step directions on how to dye their shirts in various patterns. John S. Denio, Jim Denio, and John Denio, from foreground left. Once the shirts were finished and taken back to reunion central to be washed and dried, the Denio clan posed for a group shot wearing their shirts. 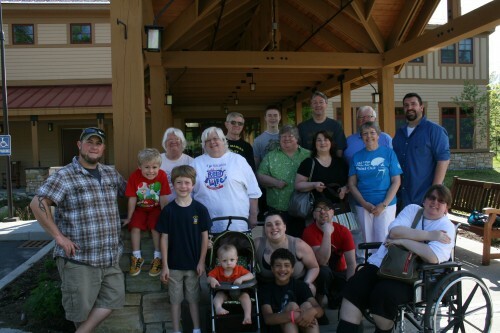 The family enjoyed lots of time together, but also branched out over the course of the weekend to do some things on their own. “Then we came together again for a big family dinner,” Martha Denio said. Maryellen Denio said that the tie-dye group activity was something new for the group this year. This entry was posted in admin and tagged carol hansen on May 31, 2012 by Carol Hansen.